UPDATE: I first published this post 7 years ago! Holy moly, where does the time go? (Spoiler alert: child rearing, cooking, baking, running a communications business, knitting, sewing, etc.) During those years, I’ve improved my bread-baking technique, and my challah has gotten even tastier. I’ll leave the original post as-is, and the updated recipe is inserted below in a format that’s easy to print. REMEMBER: if your first challah isn’t perfect, know that mine wasn’t either (“not perfect” is an understatement). Just keep baking! Mix warm water with yeast and 2 teaspoons sugar. Stir to combine. Set aside and let proof (get foamy). Begin to melt butter (or shortening) on the stovetop or in the microwave. While yeast proofs, mix 3 Tablespoons sugar, flour, and salt in a large bowl (if you plan to knead by hand) or in the food processor with dough blade in place (if you are like me and enjoy for machines to do your backbreaking labor). When the butter is melted and the yeast is proofed, mix those ingredients with 1 egg and 2/3 cup cold water and add to flour mixture. Knead by machine or by hand until the mixture comes together in a ball and feels tacky, but not sticky. You might need to add a tablespoon here or there to get the right consistency. Put the dough in a zip-top bag or large container and seal. Let it rise until doubled. Once doubled, shape the dough on a cookie sheet lined with a silicone mat (I like Silpat and Amazon Basics mats) into one large loaf, two smaller loaves, or - my family's favorite - 16 challah knot rolls. Cover with plastic wrap and then a clean, dry kitchen towel and let rise another hour or so. Heat oven to 350. Crack second egg into a bowl and lightly beat with about a tablespoon of water. Lightly brush challah with this egg wash.
Place cookie sheet on center rack of oven once heated. Bake accordingly (but check on it, as cooking times vary oven to oven): 20 minutes for large loaf, rotate 180*, bake another 10 minutes or so; 15 minutes for two smaller loaves, rotate 180*, bake another 10 minutes or so; or 10 minutes for challah knots, rotate 180*, bake another 7 minutes or so. That is no exaggeration. This challah recipe is incredible. Plus, since you make it with a dough blade in the food processor, it’s a snap! Don’t have a big (11-cup) food processor? Well, find some room in the budget and invest in one. You’ll never buy a loaf of bread again. Seriously, we mean it. Stacey hasn’t purchased a loaf of bread since she found this recipe in the booklet that came with her Cuisinart machine. -In 1/4 c. warm water, put in 2 ¼ tsp. (or one packet) of dry yeast. In a separate bowl, measure out 4 Tbsp. of sugar, and take 2 tsp. of sugar from there and add it into the yeast mixture. Let sit until foamy. -Meanwhile, melt a stick (8 Tbsp.) of butter in the microwave. Take an egg out of the fridge, crack it in a bowl, give it a little whisk to break the yolk (but don’t scramble!) and set aside. -Put 3 c. all-purpose unbleached flour and 1 c. wheat flour (or all white flour, whatever you prefer) into the machine. Pour in the remaining sugar and 2 tsp. of salt. -Remove from the bag once doubled, divide into three equal parts, braid, cover with plastic wrap that you’ve sprayed with cooking spray, put a towel over it and let it rise until doubled, about another 45 minutes. -Pre-heat oven to 375. Brush challah with egg wash. Bake challah for 20 minutes on the bottom rack of the oven. Turn down heat to 350 and bake another 9-10 minutes. NOTE: Check your oven temperature and watch the loaf in the oven to make sure that the challah doesn’t brown too quickly. It should be light brown after the first 20 minutes. 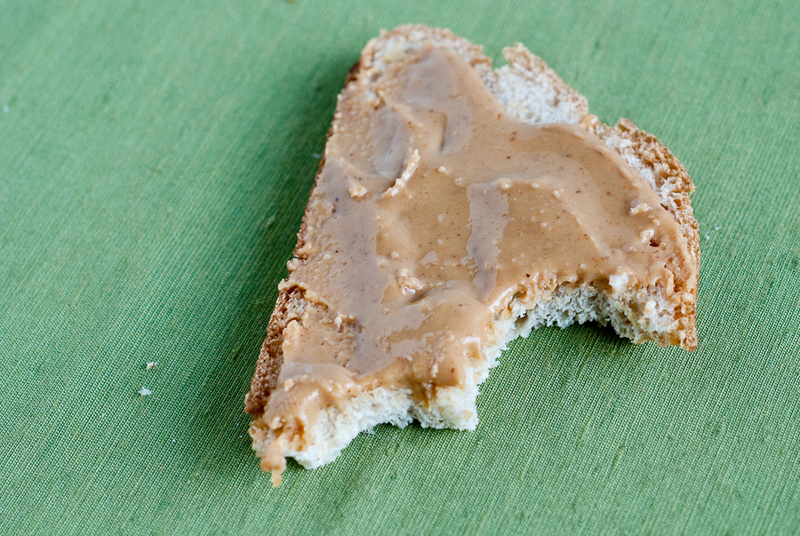 March is National Peanut Month, so why not enjoy a slice of challah with some creamy or crunchy peanut butter? A total comfort food, and fave among many, peanut butter is so versatile and delicious. While it does get a bad reputation due to being high in fat and calories, it is also a good source of protein and Vitamin E. If you’re concerned with the fat and calories, this is where minding your portion size becomes critical. The serving size for peanut butter is 2 Tablespoons, and a little can go a long way. What are your bread-baking secrets? Did you run into any challenges when making this recipe? How Stacey Got the Shot: With the “Nifty Fifty” lens at ISO 100, f/4.5, 1/60 second exposure. Homemade bread… I’m drooling. Oh… And I’m looking at my budget and thinking that right about now would be a good time to get that KithenAid mixer I’ve had my eyes on for a while. everyfoodfits.com » Muffin tin, repurposed. A recipe for challah egg cups.